You could say Robbie Thomson was destined to play for Raith Rovers. The 25-year-old goalkeeper is the son of former Raith shotstopper Scott Thomson, the man who made the most important save in the club’s history. Thomson Jnr was just one-year-old when his dad made history, denying Paul McStay in the penalty shoot-out to win the Coca Cola Cup for Raith in November, 1994. Thomson Snr went on to star in the UEFA Cup run the following year, making 122 appearances for the club in total before earning a move to Hull City in 1997. Now after signing for the Kirkcaldy club this week, son Robbie is hoping to follow in his father’s footsteps by having some success of his own at Stark’s Park. “This place brings back my first memories of football,” Robbie told the Press. “I remember watching my dad here, then going out and playing on the pitch afterwards. “I had a bit of interest from elsewhere but as soon as Raith came in there was an instant attraction because this club means a lot to me and my family. Robbie will need no reminding of his father’s cult-hero status at the club as photographs of his cup final penalty save line the walls of the Stark’s Park corridors. “I wasn’t at Ibrox, I was too young, so I was getting looked after by Stevie Frail, who was our next door neighbour at the time,” he said. “But now I get made to watch the DVD every night! “I’ve played at Stark’s for opposition teams a few times, and my dad always used to wind me up by telling me to look at the pictures outside the dressing room. 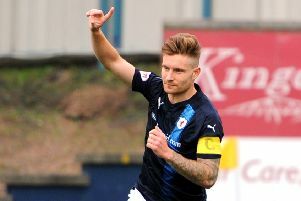 Robbie started his career at Celtic, and has had spells at Rochdale, Cowdenbeath, Queen of the South, Hamilton Accies and most recently Falkirk, where he made 27 appearances in the Championship last season. The former Scotland U21 call-up insisted, however, that he had no qualms about stepping down to League One to sign for Raith. “”Everyone wants to play at the highest level they can, but sometimes you have to look at the bigger picture,” he said. “I’ve played a lot of games for my age, but I want to get a bit of success on my CV, and that was one of things that drew me to the club. “I want to be part of some positivity and a successful team, and hopefully I can do that here. Not just that, but in terms of Scottish football, Raith are one of the bigger clubs with bigger fan bases. After narrowly missing out on the League One title last season, Robbie is hoping to play his part in taking the club on step better in the coming campaign. “I pride myself on trying to be consistent as I can,” he said.